Forest toad tree is a native of Sothern Africa. 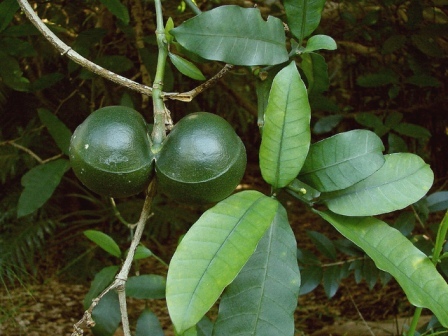 It grows in riverine forests and the forest understoreys in the coastal areas of KwaZulu-Natal. It is also found in Zimbabwe and Mozambique. The fruits which are edible, are paired. These are covered in light brown warts resembling a toad’s skin, hence the common name forest toad tree. This is a small to medium-sized tree which can attain a maximum height of 15 m, but averages between 4 and 8 m. It has a single, slender, straight trunk with smooth grayish-brown bark. The tree is low branching with smooth, dark green young branches turning a pale brown when mature. 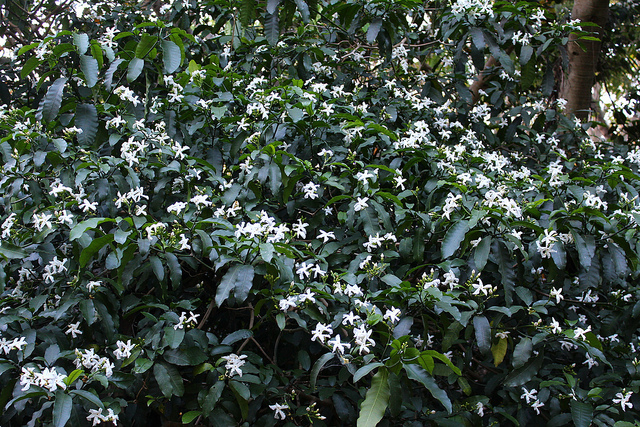 The flowers are salver-shaped, white and sweet scented. 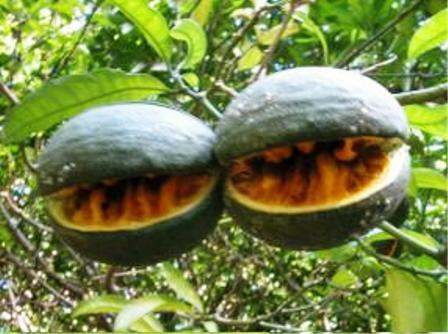 The fruits are pods, usually two joined at the base. They are dark green and smooth, sometimes with wrinkles and light green speckles or markings. They split open to reveal fleshy orange pulp with embedded seeds in June to August. The ripe orange pulp is edible and fondly taken by local people. The bark of this tree is said to be used for bringing down a fever and the sap can be used to treat wounds and sore eyes.. The wood is suitable for using as planks. It is said to be insect-proof. This small to medium- sized evergreen tree with its dark green leaves and large dark green fruit will make an attractive addition to your garden. The tree prefers full to semi-shade, but can withstand a certain amount of sunlight. It requires a moderate amount of water. This tree is frost sensitive, preferring more tropical areas with mild winters. It can easily be grown from seed and grows relatively fast. Lowveld National Botanical Garden, South Africa.